Lucinda is a psychic, working by day for the British Museum and by night as a fortune teller. Although previously approached by The Lords of Path of Purest Light and The Fallen Lords of the Paths of Darkness, two adversarial groups of various psychics, she had chosen to remain unaffiliated with either. However, when approached once again by a messenger from the Path of Purest Light who tells her she is needed to help avert the end of the world, she agrees to perform the mission put before her. Chosen because she has quite powerful abilities and perhaps as she can do things a full member of Purest Light group would be permitted to do, she has many obstacles in front of her, not the least being the active efforts of the Path of Darkness to thwart her. To make matters more difficult, she doesn't know exactly what is required of her as only bits and pieces of that is fed to her at a time. The tale takes place in various locales, and this is both a strength and weakness. When in Kerry, Ireland, the author's descriptive skills bring the place alive. This is particularly true with Skellig Michael a rocky island off the coast which houses an ancient monastery. Although the author made one surprising error in timing on when the monastery was thought to be started, the rest of his description of it seemed pretty accurate, at least according to the research which this story piqued my interest enough to do. I actually want to add this to my list of places to see next time I am in Ireland. On the other hand, the author's description on Egypt of the 6th Century was not quite as well researched. This Egypt was too "Rome-Roman," if I can coin a phrase. While it was clear that the rulers of Egypt at the time were the Byzantine Romans, the descriptions were more Western Roman than Eastern. For example, the Byzantine Empire was a decidedly Christian entity, yet in this story, there were numerous temples and statues of the old Western Roman gods. Other details such as timekeeping were not correct as well, using modern procedures instead of those used at the time. There were also some repetitive errors in logic. Granted, people do make errors like this every day, but to me, at least, some of these did not seem logical. One example of this is that even after Lucinda knew that Jacinta, the messenger sent to recruit her, had been corrupted by Ethan, a powerful member of the Fallen Lords sent to stop Lucinda, in such a way as to enabled him to read Jacinta's thoughts, Lucinda still kept telling Jacinta all her plans and where she would be next. Characterization was also both a strength and weakness. Jacinta was well-fleshed and believable. Her desire to be more than a spear-carrier despite her less-than-powerful abilities came through easily. Joe, a local fisherman with weak psychic abilities, was also nicely envisioned. It was with Lucinda where I had my biggest problem. Initially, I thought Lucinda was great. Feisty, ornery and with a little bit of a cruel streak, she was an unusual protagonist. I frankly loved her as a character. But as the story went along, she became more and more bland as if she was only a conduit for the storyline. Her actions seemed at odds with her character as originally portrayed. To be blunt, I felt a little deflated the deeper into the story I got. Only her ongoing questioning her seeming enjoyment in using her power to cause suffering in others kept her character alive and somewhat interesting. Overall, this is an enjoyable read. I will undoubtedly pick up the second volume of this trilogy to see just to where Lucinda's adventures will take her next. 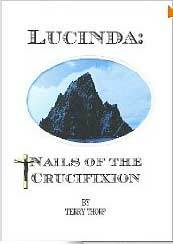 For more reviews or to buy Lucinda: Nails of the Crucifixion from Amazon.com, click here.